President Donald Trump just said the US will place “large sanctions” on Turkey for detaining an American pastor for nearly two years — a move that could seriously ramp up tensions between the two NATO allies. The pastor, Andrew Brunson, is originally from North Carolina but has lived in Turkey for more than 20 years. Turkish authorities detained him on October 7, 2016, claiming that he was a spy and had connections to a terrorist group. 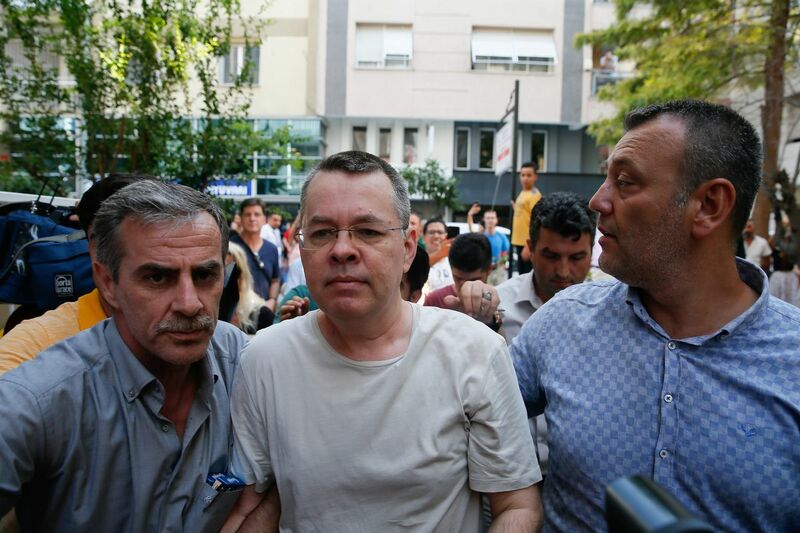 The US expected him to be released on July 18, but on Wednesday, Turkish officials moved Brunson due to health concerns and kept him under house arrest. The charges he’s facing mean he could spend the rest of his life in prison. Earlier in the day, Vice President Mike Pence had noted the possibility of sanctions during a speech at a conference on religious freedom. So clearly, Brunson’s predicament is on American leaders’ minds. “It has become a personal issue for the president and vice president,” Aaron Stein, a Turkey expert at the Atlantic Council think tank, told me. The administration’s sanctions threat marks an escalation in rhetoric and tensions between Washington and Ankara. But the Brunson issue is actually a flashpoint for much larger problems in current US-Turkey relations —and has the potential to turn a longstanding ally into a longer-term enemy. Pastor Andrew Brunson was moved to house arrest on July 25, 2018. Howard Eissenstat, a Turkey expert at St. Lawrence University, tells me the pastor’s case has impassioned many evangelical Christians — mainstays of Trump’s political base — precisely because of Brunson’s faith. But it also matters who holds him captive. Christian persecution is on the rise in Turkey, as Turkish President Recep Tayyip Erdoğan systematically dismantles his country’s historical secular democracy in favor of ruling by the tenets of Islam (more on that in a minute). The people in Washington who care about the Brunson dilemma tend to see the issue through that ideological lens: a persecuted Christian trapped in an increasingly Islamic country. It’s mostly what’s motivated the administration and its supporters to set the pastor free — and not simply the fact that he’s a US citizen unjustly imprisoned abroad. “Washington’s been doing the right things on the Brunson case for kind of the wrong reasons,” Eissenstat told me. Brunson continues to receive help from the US Commission on Religious Freedom — a government agency that helps promote an individual’s right to belief around the world — as well as private lawyers. One of Brunson’s attorneys, Jay Sekulow of the religious liberty-focused American Center for Law and Justice, is also the president’s lawyer in special counsel Robert Mueller’s probe on possible Trump-Russia collusion during the 2016 election. Should the legislation pass in Congress, it seems like that Trump would sign it. Finally, Trump has shown a distinct interest in bringing Americans imprisoned abroad back home. The Trump administration worked with Egypt to release Aya Hijazi, an Egyptian-American aid worker, from captivity in April 2017. That October, Trump announced the release of American Caitlan Coleman, her husband, and their three children who were born in captivity. And in May, Trump secured the release of three American hostages who were being held in North Korea. While religious reasons may motivate Trump to have Brunson released, it’s also likely he wants to continue his success in hostage negotiations. 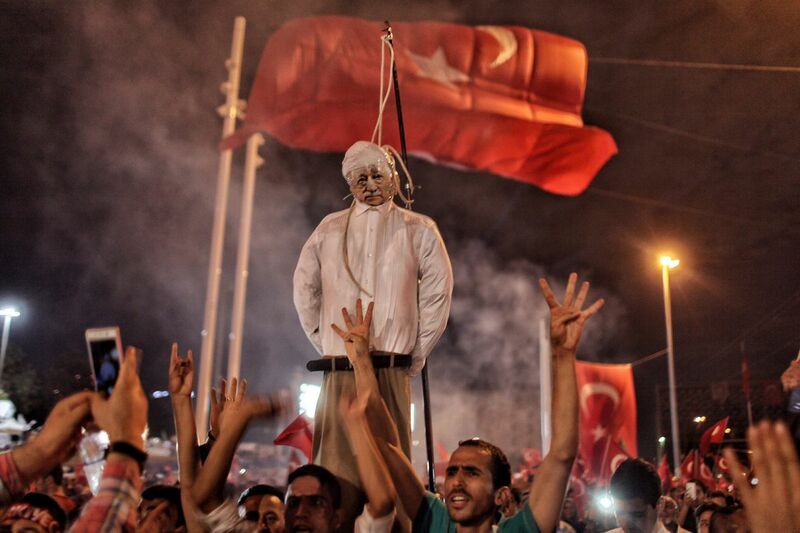 Supporters of Turkish President Recep Tayyip Erdoğan burn an effigy of US-based cleric Fethullah Gülen on July 18, 2016, in Istanbul. Why would Turkey continue to detain Brunson if it’s causing this much trouble? It’s because Ankara sees him as potentially useful leverage in so-called “hostage diplomacy” in the unlikely extradition of a Turkish US-based cleric named Fethullah Gülen. Here’s the background: In July 2016, parts of Turkey’s armed forces attempted a coup d’etat against Erdoğan. The Turkish leader stayed in power and immediately cracked down on any perceived dissent within the military, press, political elite, civil society, and more. Erdoğan, without evidence, blamed Gülen for instigating the coup attempt and called for his immediate return to Turkey to stand trial. The problem for Erdoğan is that Gülen currently lives in Pennsylvania. He came to the United States in 1999 to escape political and religious persecution from a previous Turkish administration. He preaches an inclusive brand of Sunni Islam that emphasizes cooperation and tolerance and views modernity as broadly compatible with Islam, stances that did not sit well with the administration of then-Turkish Prime Minister Bülent Ecevit. The US has so far rejected the idea of sending Gülen back to Turkey, and it’s caused a split in US-Turkey relations that continues to this day. Erdoğan knows that Brunson remains important to the United States. He therefore may believe that holding on to the pastor may at some point compel Trump to agree to a one-for-one trade for Gülen. But Eissenstat, the Turkey expert, doesn’t believe Trump would make that deal on the off chance the Turkish leader offered him up. As of now, there’s no sign that Turkey will voluntarily let Brunson go. That’s probably why the Trump administration wants to levy sanctions as a way to change Ankara’s mind. Turkey has so far pushed back on Trump’s threat. So it’s unclear, but perhaps unlikely, that the sanctions threat will work. And even if it does, US-Turkey relations have already hit a significant low point. That means the gap between two NATO allies is only growing larger — and it’s unlikely that will resolve itself anytime soon.